I am going to implement push notification for my Xamarin Forms project targeting IOS, Android and UWP. Is there any Nuget Package available for this feature? Or this feature requires platform-specific implementation? And is push notification works on UWP? What is Azure Notification Hubs? Is that necessary to implement push notification in xamarin forums? I found a blog about this feature here, but in that the notifications are sending from Azure portal. My project was a chat application and the push notification should come when a new message sends. Any help would be greatly appreciated. Sample codes or tutorial references are welcome. Of course, UWP could use this feature. 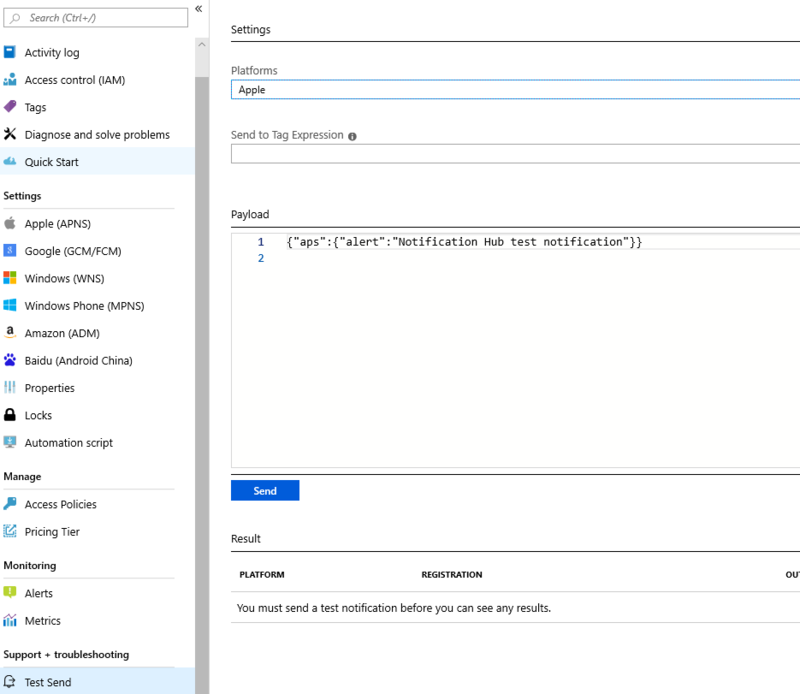 Refer to this documentation for how to implement Azure Notification on Xamarin Forms: https://docs.microsoft.com/en-us/xamarin/xamarin-forms/data-cloud/push-notifications/azure. @LandLu Received a test notification to my device from FCM. The problem was with the device token, every time different tokens are generating for the same device. I keep tried with the initial token. I think for a device the tokens are always constant. Why different tokens are generating for the same device? Can you please clear this doubt? Why different tokens are generating for the same device? If the app hasn't been uninstalled, yes the token won't be changed. You could get that token by FirebaseInstanceId.Instance.Token;. But if you reinstalled your app every time you debugged the project, the OnTokenRefresh would be fired and the token changed. This can't be used as the device's unique identifier. Hi @LandLu Thanks for the documentation. I have some doubts, Is Azure Notification Hubs are free? In this documentation, the notifications are sending from the Azure portal. My project was a chat application and the push notification should come when a new message sends. How can I handle that from back-end? Our back end is Java. I have some doubts, Is Azure Notification Hubs are free? Yes, it's free. It based on the APNS for iOS and FCM for Android. And they are the Apple's and Google's services. I just post the sample for the client side. You should connect your own server to Azure's service. You could use asp.net or jave to build your server, it's up to you. When a message comes to the client side, it must be sent from your back-end. You should notify the Azure's service to send a notification too at the same time. My friend suggested me to do this feature using AWS. Is this possible? Which method is the simplest? AWS or Azure? Totally confused after reading the documents and didn't started the implementation after 2 days. Now I don't know from where to start this feature. I haven't used ASW before. I think it's not difficult to implement Azure for notifications. And this is a forum for Microsft Xamarin. If you faced issues when you are implementing Azure. You could ask it both here and on Azure's forum. But for AWS. I've no idea about that. Hi @LandLu I have started implementing push notification. Update: This was the issue with the device. When I change the device the tokens are generating. Now I am trying to send a sample notification from the FCM console. @Sreeee Glad you solved it. If you have other issues please feel free to open a new thread here. I received the token and now I am trying to send a test notification to my device. Is that done from the FCM or Amazon SNS? From where I need to send the push notification? @Sreeee It depends on what libraries are you using, I recommend FCM. @LandLu I tried sending from FCM, but not delivering. @LandLu I have another doubt, can you please clear it? How can I subscribe to this in MainPage.xaml.cs? I tried like below, don't know the exact syntax: How can I add OnMessageReceived as the last argument? I saw this method in this tutorial video. @LandLu I added codes to my ios project for handling the notification. But stuck on an issue on RequestPushPermissionsAsync(). I got this codes from this tutorial. This is far away from this case's topic we talk about at early time. I think you should open a new thread, we could discuss this issue there. And this is better for other community members to participate in it or understand the same issue. I will start a new thread for this. @LandLu I am getting NullReferenceException when doing push notification in UWP, I have started a new thread here. Can you please help? @LandLu Is it possible to call Azure Notification Hub vai Postman? @LandLu How can I open a specific content page when clicking a notification? @Sreeee What libraries are you using now to implement the notifications? I am using FCM for android and IOS. Not implementing UWP now. I am not using Azure or AWS now. @Sreeee I have something emergency to do today. Will update you later. Hi, @LandLu Are you free today? Can you help me to open a content page when tapping the notification? I have added only 'OnMessageReceived' function, but when tapping notification code execution not entering that part. Didn't implement any notification handler, how can I do that? I have started a new thread for this.